Of all the products to launch at CES 2017 one of the most fascinating has to be the Kerastase Hair Coach. This is a smart hairbrush, co-developed by Withings and L’Oreal, to enhance your hair quality. 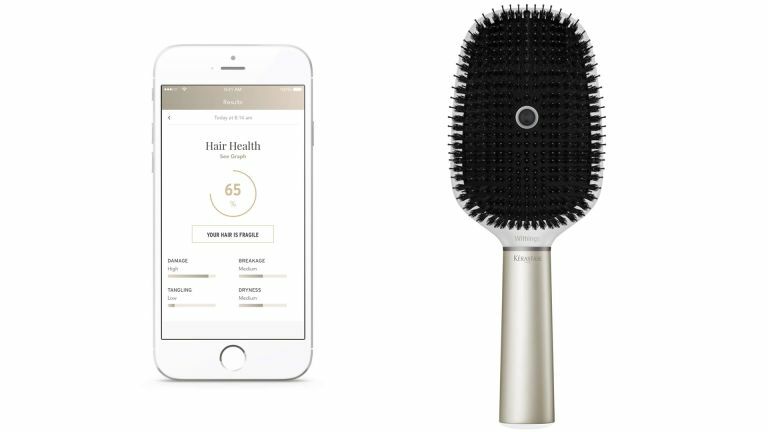 The smart hair brush connects via Wi-Fi or Bluetooth to your smartphone where the accompanying app can feedback everything learned about your hair. But how does it know what’s going on in your coiffure? It listens for one thing. The Kerastase Hair Coach features a microphone to listen to the sound of brushing. This is able to identify patterns to determine frizziness, dryness, breakage and even split ends. That’s then combined with other sensor data for a clearer picture of your hair and haircare process. A 3-axis accelerometer and gyroscope measure force applied to the hair and scalp when brushing and analyse patterns to give vibrating haptic feedback if it is being done too roughly. Conductivity sensors are also used to determine if the hair is being brushed dry or wet. This helps to further enhance the measurements for more accurate feedback. Like any good activity tracker the accompanying app is what offers all that data in understandable feedback. This can then be used to enhance the haircare process using a hair quality score and personalised tips. This should also take into consideration environmental conditions like temperature, light, humidity and more to give the most accurate measure of your hair. The Kerastase Hair Coach will arrive mid-2017 for under $200, which is about £160. Now you can check out everything else revealed at CES using the link below.